Simon & Schuster, 9781501193088, 288pp. Russian sentences begin backward, Sophia Shalmiyev tells us on the first page of her striking, lyrical memoir, Mother Winter. To understand the end of her story we must go back to her beginning. 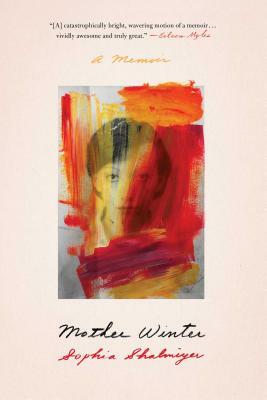 Now a mother herself, in Mother Winter Shalmiyev depicts in urgent vignettes her emotional journeys as an immigrant, an artist, and a woman raised without her mother. She tells of her early days in St. Petersburg, a land unkind to women, wayward or otherwise; her tumultuous pit-stop in Italy as a refugee on her way to America; the life she built for herself in the Pacific Northwest, raising two children of her own; and ultimately, her cathartic voyage back to Russia as an adult, where she searched endlessly for the alcoholic mother she never knew. Braided into her physical journey is a metaphorical exploration of the many surrogate mothers Shalmiyev sought out in place of her own—whether in books, art, lovers, or other lost souls banded together by their misfortunes. Sophia Shalmiyev emigrated from Leningrad to NYC in 1990. An MFA graduate of Portland State University, she was the nonfiction editor for The Portland Review and is a recipient of the Laurels Scholarship and numerous Kellogg’s Fellowship awards. She has a second master’s degree in creative arts therapy from The School of Visual Arts, previously counseling survivors of domestic violence and human trafficking. Her work has appeared in Vela Magazine, Entropy, Electric Lit, The Seattle Review of Books, Ravishly, and The Literary Review, among others; all with a feminist lens. She lives in Portland with her two children. Mother Winter is her first book.